RNH Academic Director Professor Hannes H. Gissurarson was one of the speakers at an international conference on communism organised by the Estonian Institute of Historical Memory on 23 August 2018. His participation in the conference formed a part of the joint RNH-ACRE project on ‘Europe of the Victims’. Gissurarson argued that it was not a coincidence, and rather an inevitable outcome, that everywhere communism had led to totalitarianism, oppression and misery. The originators, Karl Marx and Friedrich Engels, had been full of hate and violence, as their writings, not least their exhange of private letters, showed. The two of them had also adhered to extreme scientism, believing that science was the possession rather than the pursuit of truth. Thirdly, after a revolution there was always the danger that the cruellest and most ruthless filled the vacuum left by the former powers, as Edmund Burke had pointed out in his critique of the French Revolution. Oksanen and Gissurarson in Tallinn. Photo: Mari-Ann Kelam. Gissurarson elaborated on two further reasons why communism would develop into totalitarianism. In a country where the state was the sole employer, any opposition would encounter almost insurmountable difficulties: the really significant freedom was the freedom to dissent. Fifthly, the core communist programme was the abolition of dispersed ownership and freedom of trade, but it was precisely under those conditions that the dispersed knowledge of individuals was utilised, as Friedrich A. Hayek had demonstrated. If the state operated all the means of production, it would have to reduce and simplify human needs in order to implement its plans and decisions. This the state could only do by seizing control of the most important means of moulding human souls, such as schools, the media, the courts, art, science and sports, but it was precisely such a system that would be defined as being totalitarian. At the conference, Gissurarson introduced his two recent reports, Voices of the Victims: Notes Towards a Historiography of Anti-Communist Literature, published by New Direction in late 2017, og Totalitarianism in Europe: Three Case Studies, published by ACRE in early 2018. 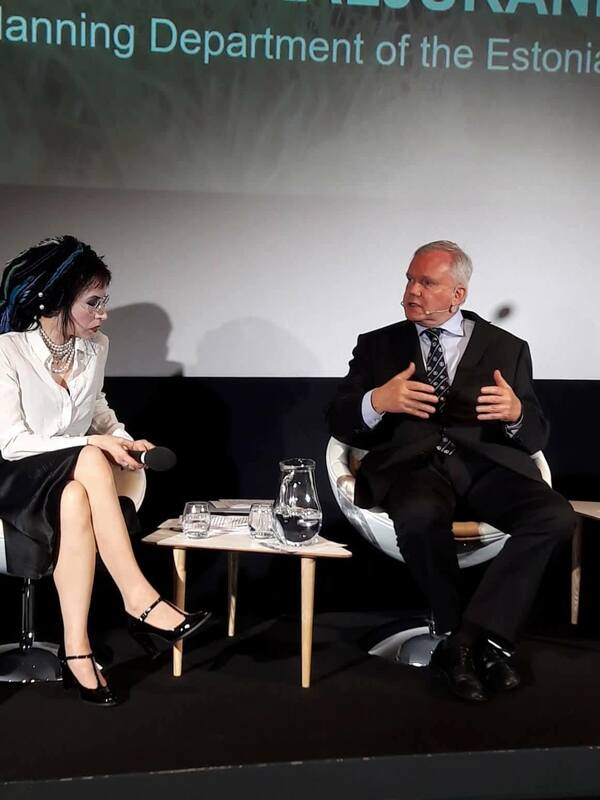 Other speakers at the conference included Finnish-Estonian author Sofi Oksanen, author of best-selling novel Purge, and Professor Richard Overy, who has written an acclaimed comparative study of Hitler and Stalin. 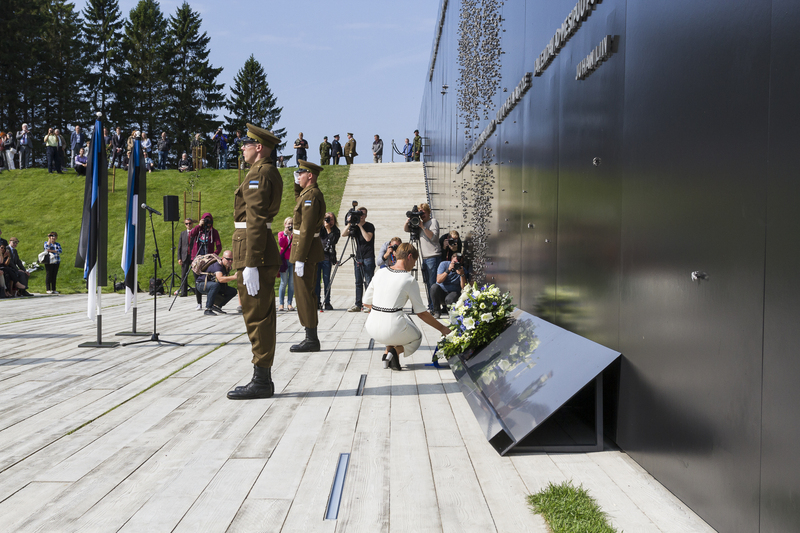 In conjunction with the conference, the President of Estonia, Kersti Kaljulaid, inaugurated a Memorial to the Victims of Communism in the outskirts of Tallinn. Guests at the ceremony and the conference included the ministers of justice of the three Baltic republics, Poland, Ukraine and other countries. President Kaljulaid lays a wreath at the Memorial to the Victims of Communism. Photo: Martin Andreller.